Chicken and potatoes in a curry? What a food winning formula and this my version Chicken Curry (Malaysian Indian Chicken Curry) With Potatoes is my own formula to cooking. I basically coined the recipe. I basically did it my way. What is the difference or why it is different? 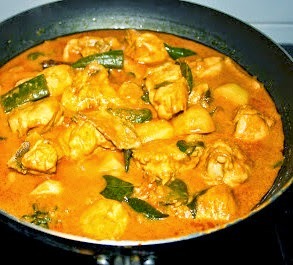 I fried the chicken (Ayam Masak Merah) first before tipping into the curry cooked with potatoes. A cooking invention of mine without compromising on mouthwatering tastiness. 1/2 chicken - cut into bite sizes. Mix chicken with corn flour, turmeric powder and salt. Deep fry, remove and keep aside. Leave about 4 tbsp of oil in the same pan/wok. Fry spices, ginger paste, garlic paste and curry paste till aromatic and oil splits. Put in potatoes, green chillies, curry leaves and tomato. Pour enough water to cook potatoes till soft and tender. Then, pour in coconut milk, add fried chicken and season with salt. Stir, simmer to heat through and remove from heat.